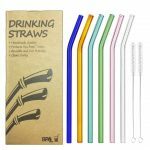 Where can I buy an alternative plastic-free for straws? Plastic straws are a daily thing and are a huge waste that will usually end up in our oceans. There are plenty of eco alternatives. These shatter resistant glass straws for example, are both durable and safe to drink from. Eco friendly and plastic free, protects your body from plastic toxins. Glass straws are reusable, environmentally friendly. Beautifully hand-made craft with 6 colors for your choose, can be used for drinking virtually anything, from hot to cold drinks, smoothies to shakes, lemonade, protein shakes, cocktails, hot chocolate, anything! And are easy to clean, simply rinse the reusable straws after use or place in the dishwasher. Two full length cleaning brushes are included just in case of clogging. The package includes: six pieces of Bent Glass Straws (200 mm *10mm ), and two pieces of Cleaning Brushes! Buy your package now! This entry was posted in Anything else and tagged bent glass straws, glass straw, reusable straw, straw clean, straw cleaning brushes on August 15, 2017 by WhereCanWeBuy.